If you have had teeth removed and are wearing dentures, you know how invaluable these replacement teeth are. Taking care of and protecting those dentures so they give you the comfort and satisfaction you deserve is easy by following a few simple steps. Dentures are expensive. Handling dentures carefully to protect them from accidental breakage is very important to avoid a costly repair. Always stand over a soft towel or a sink of water so if you drop them, the dentures will be protected. When not wearing your dentures, they should be stored in a denture cleanser or water to keep them from drying out and becoming misshapen. Take precautions if your dentures have metal parts, as these may tarnish in certain solutions. Never put your dentures in hot water, as this may bend the shape and cause discomfort. Ask your dentist for the best method of storing your dentures. We understand the importance of brushing teeth at least two or three times a day. Dentures also require daily cleaning in order to remove food, stains, and plaque build-up. Always choose a soft-bristled toothbrush to avoid damage and unnecessary wear on the delicate denture material. Be gentle in the brushing, taking additional care around the plastic areas. 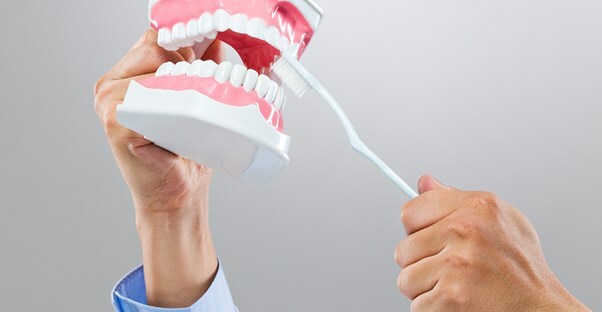 As dentures are specifically fitted to your mouth, be careful not to bend any attachments that may hinder the comfortable fit that your dentist has worked so hard to achieve. Be sure to rinse dentures after every meal to remove food and keep breath fresh. When you are doing a daily thorough cleaning of the dentures, a mild dishwashing liquid or hand soap is a perfect cleaner. Avoid toothpastes, as many have abrasives added that would mar the finish of the dentures. Do not use bleach, as it may affect the pink "gum" part of the denture. Ultrasonic cleaners are safe for denture use. These devices are small containers that immerse the dentures in a cleaning solution as generated sound waves dislodge food and debris. Always use ultrasonic cleaners in conjunction with a good daily brushing. It is always a good choice to use products approved by the American Dental Association.